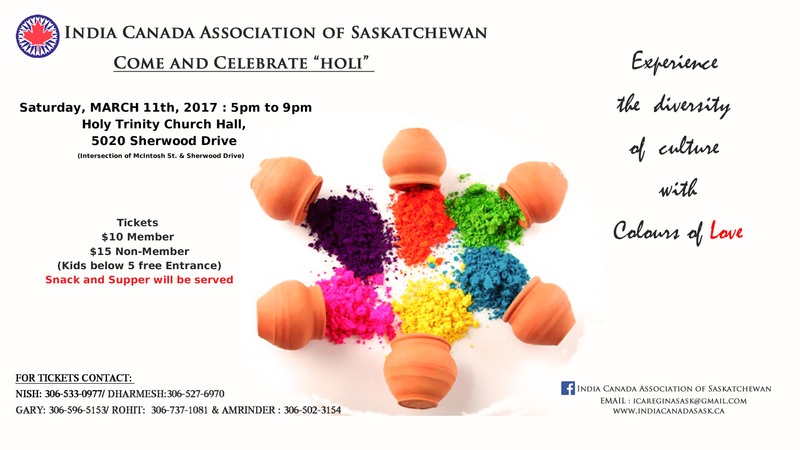 India Canada Association of Saskatchewan(ICA) invites you and your family members to come and celebrate Holi on Saturday, March 11 at Holy Trinity Church Hall, 5020 Sherwood Drive at 5:00 Pm . It will be an evening filled with fun, entertainment, music, and dance. Snack and Supper will be served. Please see the attached poster for details. Tickets are $10 for members and $15 for non-members. Kids under five are free. Book your tickets in advance. It will not last long. For tickets, please contact Nish Prasad@ 306-533-0977, Gary Grewal@ 306-596-5153, Dharmesh Gandhi@ 306-527-6970, Rohit Gupta@ (306) 737-1081 or Amrinder Sandhu@ (306) 502-3154.